​K & A Construction, Inc. is owned and operated by Karl L. Thomas, a 3rd generation general contractor and home builder. Karl has over 30 years’ experience in the new construction homes business. ​Keith Thomas joined K & A Construction, Inc. in May of 2010 as Project Manager, Estimator and Designer. Keith brings over 15 years of experience in the new home construction industry. Our construction company delivers quality and professionalism with every project constructed. References are available upon request. We are proud to build what you cherish most of all. Home. With a shared vision of unique new home design, outstanding quality and an unwavering commitment to true customer service. Tell us about your dream home. We are a family owned licensed and insured custom home remodeling company for your complete home and commercial remodeling needs. Specialized in custom home remodeling which includes bathroom renovation, kitchen remodeling, room additions and others. We also provide architectural and engineering design, 3D rendering and more. A peek into our creative nest located in Mount Pleasant, Texas. 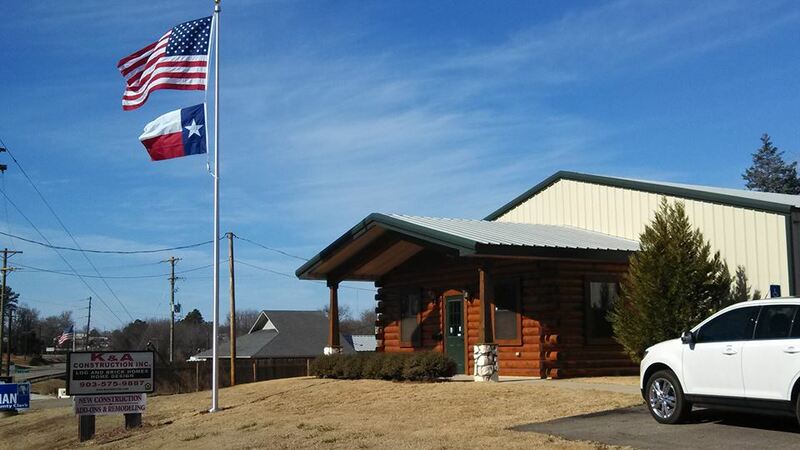 Contact K&A Construction, Inc. today for professional custom home building service, renovation, room addition or any residential or commercial building contractor serving in Mt Pleasant, Tx, Longview, Tx, Lindale, Tx , Tyler, Tx, Daingerfield, Tx, Lone Star, Tx, Ore City, Tx, Hallsville, Tx, Harelton, Tx, Marshall, Tx, Sulpher Springs, Tx, Greenville, TX, Wolf City, TX, Winnsboro, Tx, Pittsburg, tx, Mt, Vernon, Tx, Gilmer, Tx, New Diana, Tx, Jefferson, Tx, Linden, Tx , Lake Cypress Springs, Hughes Springs, Avinger, Tx, Union Valley, Cash, Lone Oak, Omaha, Cookville, Talco, Winfield, Miller's Cove, Pittsburg, Leesburg, Ebenezer, Cason, Argo, Mount Vernon, Blodgett, Paris, Texarkana, Dogwood, Lake Bob Sandlin, Maud, Red Lick, Red River, Hooks, Queen City, Atlanta, Caddo Lake, Lake O' the Pines, Lake, Cherokee, Emory, Hawkins, ​Winona, Gladewater, Harleton, Omaha, Naples, Linden, Clarksville, Annona, Avery, Dekalb, Redwater, Domino, East Texas.